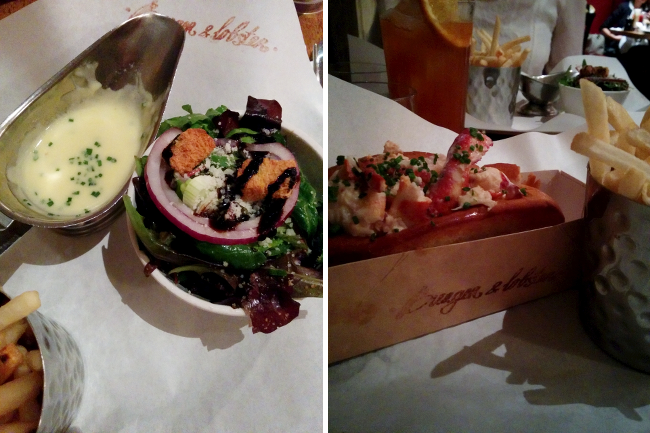 Burger & Lobster Soho. 36 Dean St, London, 020 7432 4800. I finally got to visit BL last week with Jade. We were warned about queues, especially at the Soho branch on a Thursday evening, but after giving our names and being told to wait 20 minutes, I was pleasantly surprised when we were shown to a table about a minute after sitting at the bar. Thumbs up already! Jade and I both ordered the Lobster Roll. For reference, there is no food menu at Burger & Lobster: you can choose from their burger, made from finest steak I hear, or lobster – grilled or steamed, or their lobster roll for something a little lighter. Meals come with skinny fries, a garlic butter sauce and a salad, and as a rarity, these sides are all every bit as good as the leading star. The lobster roll has steamed lobster in a light Japanese mayonaise sauce squished in between two, thick slices of grilled bread. Despite how messy it looks to eat, it actually holds together pretty well and was super filling to boot. Fries are unlimited if you so wish to have more and the salad features balsamic dressing, spinach and rocket leaves, with croutons and red onions. 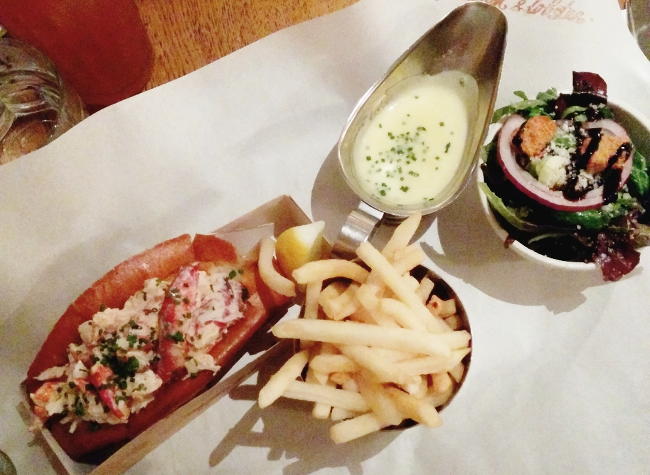 Have you succumbed to the Burger & Lobster hype yet? Ps. I’m sorry for the lack of “proper” restaurant photos, it was an Instagram-only kinda day.